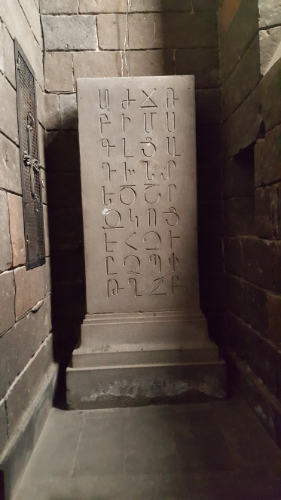 Side note: I think that someone should write an Armenian children’s book called “Mesrop Mashtots and the Alphabet Adventure”. Though I guess it wouldn’t have the same ring to it in Armenian… eh, minor details. The longest day of the week was Day 3, and we’re going to put all of the blame for that on Mike. Just kidding… well, kind of kidding. Yes, it was definitely due to him that it was such a long day, but we don’t need to assign blame because it was also a good day. 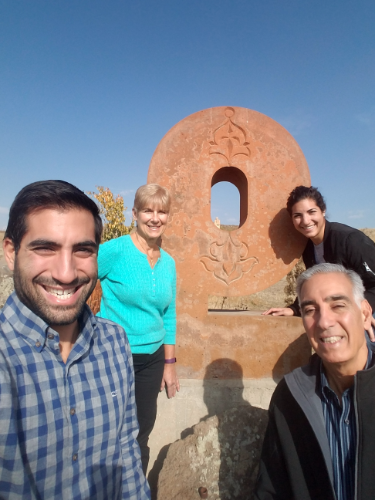 When Mike was here four years ago, he spent most of his time in Vahagni, a town in the northern part of the country near Vanadzor (the third biggest city in Armenia). One of his requests for our schedule was to go and visit the two families who hosted their group. 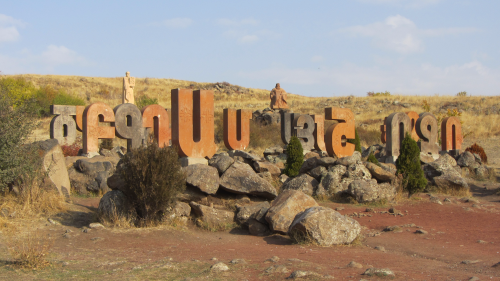 It would have been nice if Vahagni was closer to Yerevan… Oh, that would have been wonderful, but of course, no such luck. It’s about 3 hours away normally, but the road between Vanadzor and Vahagni is currently under construction which means that one of those hours is much longer and much bumpier than usual. 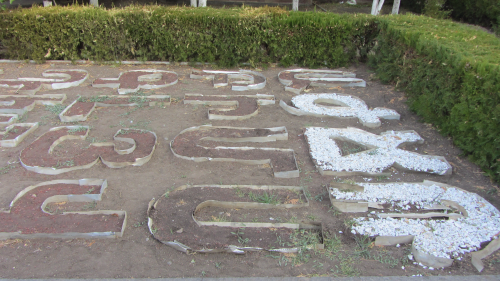 My name in Latin letters: Lara – My name in Armenian letters: Լարա. No, you’re not seeing things wrong. The “L” and the “r” are basically the same. He made all of those funky looking letters, and two out of the three in my name are nearly identical in both alphabets. Thanks for nothing, Mashtots. Like come on, if you’re going to create an alphabet, at least be creative enough to make all the letters look different. And if you can’t come up with 39 different looking letters, you probably don’t need them all. I guess to be fair, he only made 36 of them. Three were added later because while he was busy drawing about 12 letters that make the same sounds as each other, he forgot a few. Okay, I’m finished ranting, and in case you’re wondering, my Armenian learning is actually going pretty well. Despite my complaints, I can read and write decently well, and I feel like I’ve been making some breakthroughs with speaking recently. One step at a time! 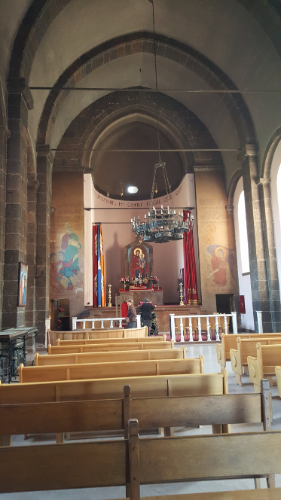 Back to the church… Surb Mesrop Mashtots Cathedral. 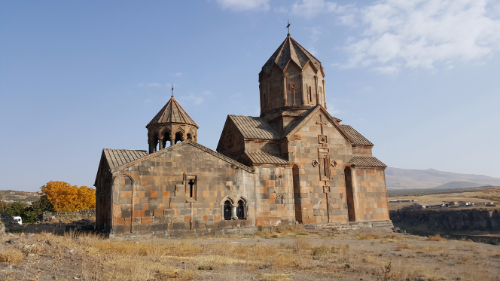 Mashtots died in 444AD, and he was buried in Oshakan. A small chapel was built on his tomb, and that chapel has since been replaced with the current church, built in 1875. 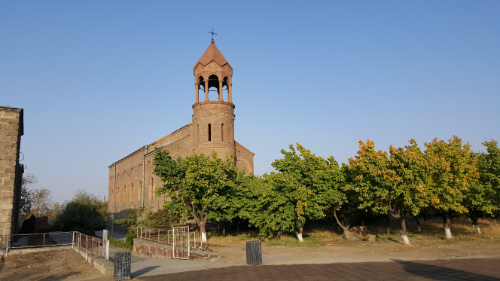 The church is pretty and looks different from most other Armenian churches because it has a bell tower instead of a dome. 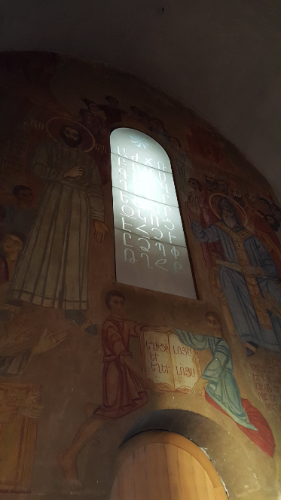 The best part of it, though, is how seriously they took the Mashtots theme. The alphabet is everywhere. EVERYWHERE. 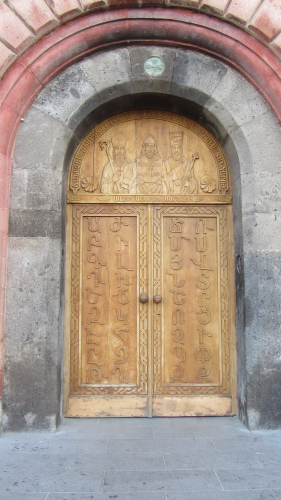 They have alphabet front doors, an alphabet window inside, an alphabet stone on your way down to Mashtots’ tomb, a work-in-progress gravel alphabet, a book monument with the alphabet carved inside, and an army of khatchkar-style stone letters. And that’s just what I can remember off the top of my head! I’m sure there are more alphabets hidden away somewhere. I hadn’t been there before, so I wasn’t sure what to expect. I’m very glad that we went, though! 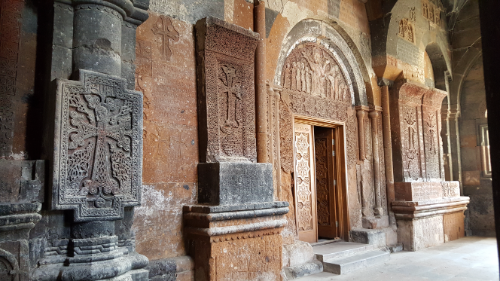 I’m surprised that I haven’t heard more about it because it’s very close to Yerevan and is really cool! I only even learned about it because I was looking up the OTHER alphabet monument. That one is more popular, but honestly, I think the letters at this one are much prettier, plus you get a bonus church and celebrity grave to check out. 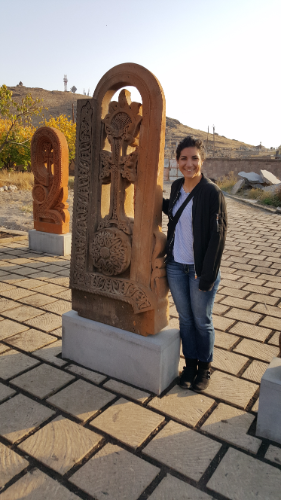 Since we were in the area already, we also made quick stops at Saghmosavank and Hovhannavank, the two churches that I visited with Shant and Carineh when we went on our made-up hike into the gorge. You can read more about that HERE. I think they’re worth the visits, especially if they’re not too far out of your way, because the views are fabulous, and the churches are pretty and have some personality. After that, we completed our alphabet pilgrimage at the famous alphabet monument that’s located randomly on the side of the highway. 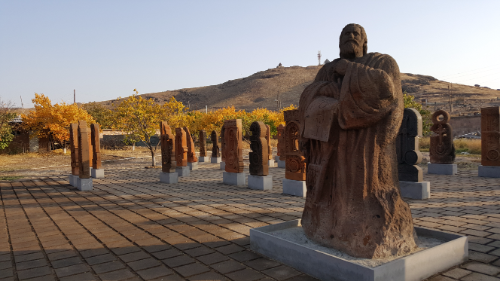 That monument was created in 2005 to celebrate the 1600th birthday of the alphabet. I’m not sure how they picked the location, but it is kind of nice because you can see Mount Aragats in the distance. Random, though. It’s definitely random. Anyway, once we were finished taking cliché pictures with our name letters, off we went, back on the long road to Vahagni.